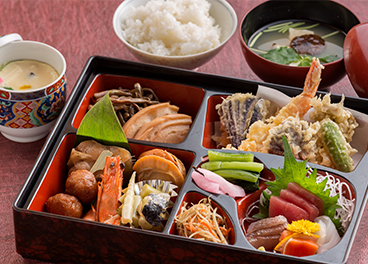 We will arrange for a catering service from the local Japanese restaurants. Servings will be self-service. You'll be able to enjoy about season's dishes, each filled with seasonal touch. We may include Sashimi (raw fish) in one of the dishes, so if you cannot accept certain food, please let us know in advance. We will try our best to satisfy you. Please order from this page. Breakfast cannot be ordered . Please bring it or cook your own meals. Kitchen and utensils for basic cooking are available. Groceries are available at stores near the House of Light. ※ Prices do not include 8% consumption tax. 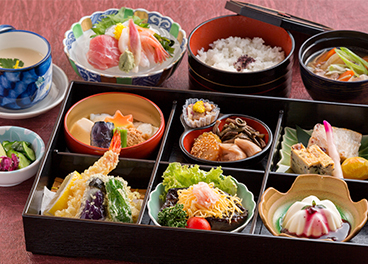 ※ Catering service is not available from 31 December to 3 January. ※ Breakfast cannot be ordered. Please bring it or cook your own meals. As the House of Light is an accommodation as well as a work of art, you are required to agree to the following conditions. ・After your check in, our staff will not stay in the accommodation at all times. Please note that your meals and bed making (Futon) are all self-service. ・When it rains, the roof of "Outside In" cannot be opened. ・In case you damage the room by allowing rain in or for another reason, you are required to sign an Agreement for compensation. ・If you are accompanied by children, please pay attention to them in the bathroom and other spaces where the lighting is dim. Unfortunately, because it is difficult for conditions to meet during the winter season, number of days when we can open the roof of "Outside in" is limited. However, we may be able to open the roof during the daytime - besides early evening and morning as mentioned in the program. - Provision of information on services, and delivery of confirmation mail. - Provision of information on events and conventions. - Delivery of greeting mail. - The Company shall not handle personal information beyond the necessity to fulfill the purpose of use without consent from the person in question. - The company shall immediately discard and delete retained personal information in an appropriate manner that becameunnecessary.